The IBM POWER9™ processor, which is available at frequencies of 2.8 - 3.4 GHz. Significantly strengthened cores and larger caches. Supports up to 16 TB of memory, which is four times more than the IBM POWER8® processor-based IBM Power System E850 server. Integrated I/O subsystem and hot-pluggable Peripheral Component Interconnect Express (PCIe) Gen4 slots, which have double the bandwidth of Gen3 I/O slots. Supports EXP12SX and ESP24SX external disk drawers, which have 12 Gb Serial Attached SCSI (SAS) interfaces and support Active Optical Cables (AOCs) for greater distances and less cable bulk. New IBM EnergyScale™ technology offers new variable processor frequency modes that provide a significant performance boost beyond the static nominal frequency. 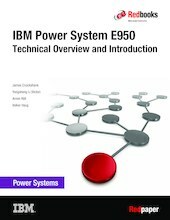 This paper expands the current set of Power Systems documentation by providing a desktop reference that offers a detailed technical description of the Power E950 server. This paper does not replace the current marketing materials and configuration tools. It is intended as an extra source of information that, together with existing sources, can be used to enhance your knowledge of IBM server solutions.